Abstract Body: Behavioral and neuroimaging studies suggest that cocaine addicts have executive dysfunction (Hester & Garavan, 2004), impairments in self-control (Goldstein et al., 2007), and elevations in aberrant activation of limbic and striatal networks (Kilts et al., 2001). Collectively, these findings suggest a major cognitive role in cocaine addiction. While current novel therapeutics for substance addiction aim to either prevent delivery through the blood-brain-barrier or decrease efficacy of cocaine on dopaminergic pathways in the brain, most approaches do not address the cognitive problems observed in users. Here, we propose a potential approach for controlling cocaine addiction by directly modulating craving states using real-time fMRI feedback. Chronic cocaine users were recruited to participate in a 6-session fMRI study over the course of 3 weeks. 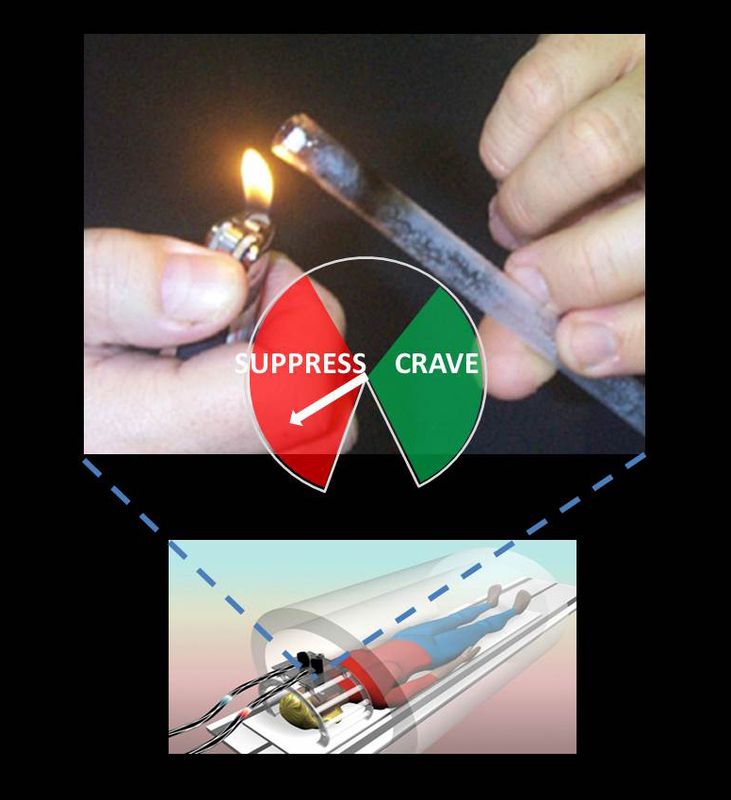 In each session, subjects were shown cue-induced craving images of cocaine and paraphernalia, and their unique craving and suppression networks were identified using machine learning (linear SVM; LaConte et al., 2007). In another run of the same session, the trained model was used to show subjects, in real-time, feedback of their level of craving via a meter on the screen. Subjects were shown cue-induced craving images and were instructed to crave in some blocks and to suppress their craving in other blocks. The visual feedback allowed subjects to adjust their neural states to crave or suppress as instructed. We allowed subjects to select their own individual strategy for craving and suppressing the drug for each session, enabling them to iterate and optimize their strategy across sessions. Subjects’ performances were determined by how well they could enter the requested state, and subjects’ improvements in cognitive function were measured with temporal discounting, working memory, and response inhibition (Go/NoGo) tasks. Drug usage during and after the experimental course was assessed by urine analysis and self-report. By leveraging real time visual feedback about neural states, we aim to provide a therapy for treatment-seeking cocaine addicts that will allow them to directly manipulate the cognitive processes giving rise to their drug use. Lay Language Summary: We are developing and testing a new therapy to help patients overcome cocaine addiction. Our therapy uses functional magnetic resonance imaging (fMRI) to help patients learn to suppress their cravings for cocaine simply with their own thoughts. There is a pressing need to develop therapies to combat cocaine addiction. Over 4 million people in the United States use cocaine each year, with nearly two thousand people trying cocaine for the first time every day. After the first single exposure, cocaine becomes addictive rapidly and serves as the single most likely illicit drug to show up in patients in the emergency room. In spite of these factors, no FDA approved treatment is currently available for cocaine addiction. Cocaine abusers have a diminished ability to inhibit their desire for the rewarding drug. This disability is underpinned by heightened activity in a network of brain areas involved in craving, and diminished activity in a network of brain regions involved in suppression. Our therapy is designed to tip the balance between those two brain networks of activity in favor of the suppression networks. We recruited cocaine addicts and presented them with stimulating images of cocaine and cocaine paraphernalia while inside an fMRI scanner. As these images were presented, we asked participants to suppress their craving through whatever mental strategy they desired (e.g., thinking about the financial impact cocaine has had on their lives, emotional stress, familial damage, etc.). Our results indicate that participants can indeed learn to move the meter into the suppress zone by engaging their suppression networks more than their craving networks. We are currently training treatment seeking cocaine addicts to measure longitudinal improvements in performance. To quantify the efficacy of this treatment, we are measuring changes in subjective craving levels as well as collecting urine samples to determine abstinence from cocaine use. Our pre-frontal gym serves as a potential therapy to help patients develop their own ability to overcome cocaine addiction by strengthening their impulse control and reducing craving. The underlying neural circuitry giving rise to drug addiction can be altered with our novel approach. Real-time fMRI feedback paves the way for developing rehabilitative strategies to foster a rational, customized approach to drug addiction for the health and legal systems.